Lapland Pond is in the Black Mountain area east of Lake George. In writing that trail network up for our upcoming Lake George hiking book, we snapped this photo. thought you might enjoy it. We now have 19 of the 25 biking trails done for that book. Looks like it'll be out by Spring! It was a chance meeting when Stuart Delman snapped this pic of me at the 5 combines in Hudson falls, NY. I was there to evaluate the Feeder Canal trail for a future biking eco-tour. He's a recent addition to our TNT outings e-mail but hasn't had a chance to join us yet. It was good to meet him. And, he caught me working. That's twice this month that someone has caught me working. I need to back off a bit. Honest, I really do work! Diane Collins, the co-author of our upcoming NNY Wildflower book, caught this shot of me taking a picture of Harebell flowers up on the Deer Leap trail north of Bolton Landing. That will be one of the featured trails in the book. So for those of you who never see me work, day or night, this is proof that I can actually be found working, albeit not TOO hard. Hi to all, and a simple warning. I'm not a wildlife biologist, but even I have noticed a substantial increase in the tick population in recent years, in both Florida and New York. You can get them most anywhere, from your garden to the great outdoors. They are very small critters that can cause very big health problems. 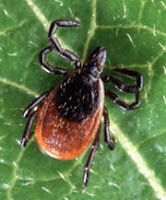 In the last couple of months I've had one hiking friend with an embedded and infected tick, taken a tick off another friend, and talked to a guy who got lyme disease from a tick bite under his watch. "The sickest I've ever been," he said until doctors who had previously diagnosed it as a spider bite, ran a test for Lyme disease. We've found that preventive bug spray, long sleeve shirts and long pants have minimized our exposure to them when out hiking.